Genea-Musings: American Ancestors by NEHGS Announces an Unprecedented, Historic Event for Genealogists: A BILLION Records FREE! 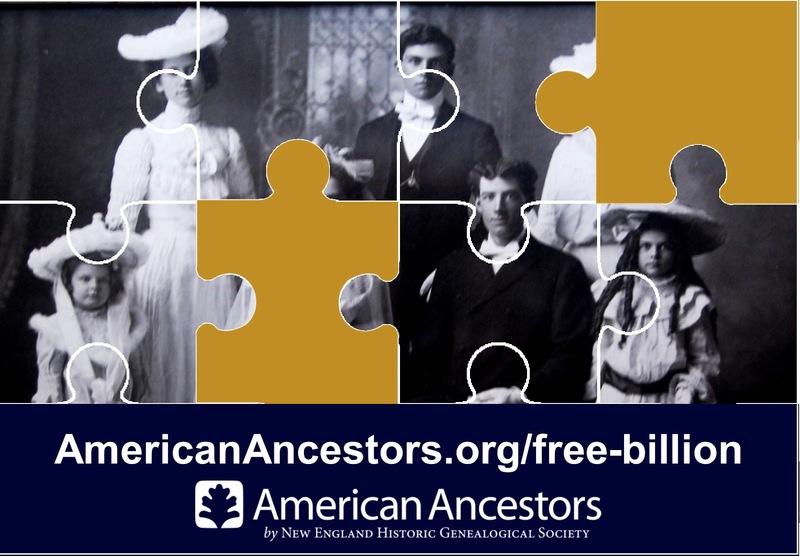 American Ancestors by NEHGS Announces an Unprecedented, Historic Event for Genealogists: A BILLION Records FREE! To assist family historians of all levels in locating more pieces of the family tree puzzle, NEHGS is granting this unprecedented free access to its entire collection of genealogical databases from Wednesday, April 6, 2016, at 12:00 a.m. (EDT) throughWednesday, April 13, 2016, at 11:59 p.m. (EDT). Free accounts on AmericanAncestors.org ordinarily allow visitors only a sample of the vast offerings that NEHGS provides family historians of all levels. This unprecedented free access promotion by NEHGS from April 6 through April 13 offers the Society’s entire collection of online content for eight full days to anyone who registers for a free account. This is an excellent opportunity for non-NEHGS members to sample the website and find records for their ancestors. don't forget all of the digitized periodicals - see Tuesday's Genealogy Tip - Access 28 Genealogy Periodical Collectionss on AmericanAncestors.org.